There are several great reasons to go to urgent care. If you have non-life-threatening symptoms that need immediate relief, you should consider a visit to an urgent care center. For conditions such as earaches, sprains, minor cuts, and flu, an urgent care center can provide treatment that is often faster and less expensive than an emergency room. If you think your symptoms could be the sign of a heart attack or another very serious condition, you should get to an emergency room immediately. Urgent care clinics are best for non-threatening injuries or illness. When should you go to urgent care? An obvious advantage of an urgent care clinic is the speed of care. Urgent care staff often get patients in with a medical professional in less than an hour. Like emergency rooms (ER), urgent care offices are typically open 365 days a year. However, urgent care center visits are usually much cheaper than the ER. Strep throat. Strep throat is highly contagious. If you or your child have symptoms of strep, an urgent care clinic can usually test, diagnose, and treat the infection immediately. Given the quickness with which strep throat can spread, it’s best not to wait for a doctor’s appointment to seek treatment. Minor sprains and breaks. Most urgent care clinics have X-ray technology on site. If you suffer a sports injury or any type of serious fall, ice and rest the injured area and head to an urgent care center. If you suffer a compound fracture (the bone is protruding from the skin) or any extremely dangerous injury to the neck or back, you should visit an ER. Flu shots and cold treatment. Urgent care centers often offer the seasonal flu vaccine and can also treat flu and cold symptoms. There are medications that can reduce the duration and impact of flu, and they work best if taken in the first two days of infection. When you experience cold or flu symptoms, let the medical professionals at an urgent care center diagnose and treat your symptoms quickly. Cuts and minor wounds. Stitches for minor cuts can easily be handled by an urgent care clinic. They can also typically provide tetanus shots and prescribe antibiotics, if there is concern about infection from your cut. Tick bites. A tick bite is no minor bug bite. If you are bitten by a tick, it is wise to have a blood test for Lyme disease and Rocky Mountain Spotted Fever. These dangerous conditions are best treated with early detection, so do not hesitate to visit an urgent care center after a bite from a tick or any other insect, especially if you start showing signs of infection. 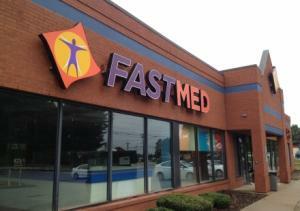 When you need quick and affordable care for common illnesses and injuries, FastMed Urgent Care can help. Our medical professionals are prepared to treat a wide range of conditions with compassionate and caring attention.